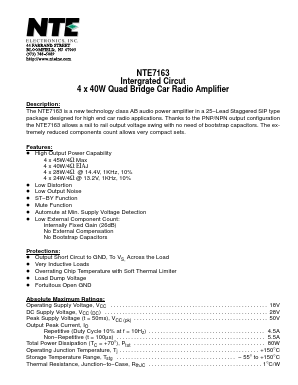 The NTE7163 is a new technology class AB audio power amplifier in a 25−Lead Staggered SIP type package designed for high end car radio applications. Thanks to the PNP/NPN output configuration the NTE7163 allows a rail to rail output voltage swing with no need of bootstrap capacitors. The extremely reduced components count allows very compact sets.